FotoInsight produces innovation in rapid succession. Only two months into the launch of the latest FotoInsight Pro Software the online photo service releases an upgrade for additional, larger photo book formats, classic covers and the new PictureLive DVD service. The new version of the FotoInsight Designer software is available as a free download. Half of all households use digital cameras. A growing share of camera users take high resolution pictures which can be enlarged to poster size. While computers, mobile phones and cameras have a tendency to become ever more compact, the resolution (or number of pixels) of digital images is growing ever larger. In line with it grows the demand for large format prints. FotoInsight serves this trend with posters, canvas printing and the new XL photobooks, in which pictures can extend across a 60cm / 24” wide double page spread. The FotoInsight Pro photo book software is intuitive and does not require specialist knowledge. 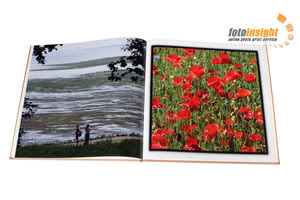 According to the vendor, the Layout Assistant in its “FotoInsight Pro” photo book software can design a coffee table style photo book in XL-format in under three minutes. Users with time and patience may enjoy designing their own printed photo album page by page or simply refine the Layout Assistant’s design with texts and repositioning the images. FotoInsight now offers a range of 94 different photo book formats counted by cover, size and number of pages. Its portfolio ranges from a pocket size photo booklet through bound books in square format (8”x8” / 20x20cm) or A4 to the new XL-format (12”x12” / 30x30cm). All photo books (square, A4 and XL) from FotoInsight are available with very durable channel bind in a linen cover or in a soft or hardcover where cover and spine can be edited freely with photos and text. All photo books are available in different sizes, from 26 pages to 98 pages (increasing in eight page steps). A popular occasion for digital photo book prints is the wedding photo book. With the software upgrade FotoInsight includes over 100 layouts and backgrounds and now adds classic cover materials, e.g. faux leather and premium linen in the large photo book XL. for true coffee table photo books. FotoInsight offers an easy to use, online photo service, compatible with digital images from any digital camera or camera phone brand. According to FotoInsight’s management its prints cost less and last longer compared to inkjet printing at home. FotoInsight offers a wide range of photo presents and print products like photo calendars, photo puzzles and picture pairs. The new FotoInsight Pro offline order client also includes the PictureLive-DVD (up to 4.7 GB), providing an optional, animated multimedia slide show with background music for the DVD player on a PC, TV or DVD player. FotoInsight Ltd was founded in 2003 in Cambridge and runs an easy to use digital photo processing service, offering an extensive array of award-winning photographic print and photo gift items as well as the photo books, photo posters, photographic calendars and photos on canvas printing. Customers benefit from patented development processes and the experience of Europe’s largest independent photo lab with an installed capacity of 18 million prints per day. Photos ordered through FotoInsight are developed in one of 19 strategically located, state of the art photo labs, employing 3000 staff, with an output of over 3 billion prints per year.